Emirates Stadium. Photo by Chris Beaumont from the Londonist Flickr pool. 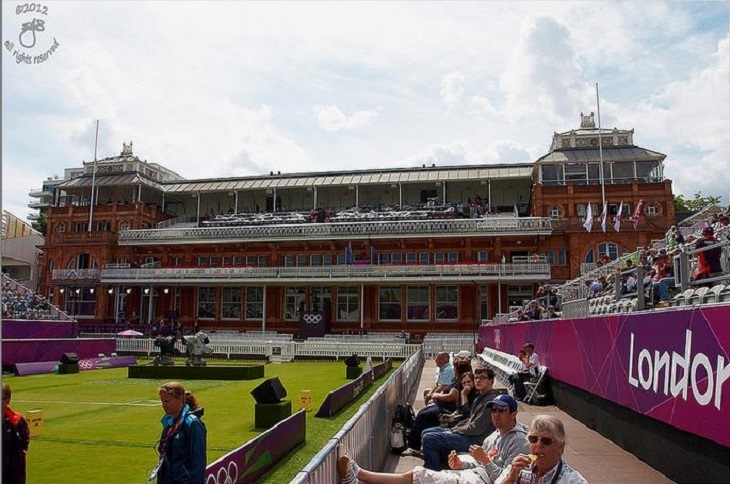 London's sporting venues may be better known by fans for what goes on inside them, but there's often a good story attached to the names of these temples of teamwork. Writer Nick Young has delved into the history and found intriguing origins of monikers that include references to old manor houses, pubs, exhibitions, a couple of Queens and several mysterious Anglo-Saxon individuals. Saracens RFC’s home since 2013 is built on an athletics track located in the Barnet Copthall sports complex in Hendon. Officially it’s named after Sarries’ sponsors, the German multi-national financial company. As for Barnet Copthall, the first part is the name of the London borough in which it is located (Barnet Council owns the land), and Copthall derives from Copped Hall, an old manor house located in nearby Totteridge that dates back to the sixteenth century and was demolished in the 1920s. Fulham’s ground does actually have a cottage-like structure in one of the corners. It is, however, named after a house called the Cottage which was built by the aristocrat William Craven (the sixth Lord Craven) in 1780. It was destroyed by fire in 1888, following which the football club built a stadium on the site, which opened in 1896. As a multi-sports venue, the Crystal Palace National Sports Centre has been somewhat eclipsed of late by the Queen Elizabeth Olympic Park although the aquatics centre and the athletics stadium are still operational. Previous sports hosted on this sight have included football (the club of the same name played there prior to 1914), cricket and, unusually for London, motor racing. It was named after the Crystal Palace which stood nearby from 1854 (when it was moved from Hyde Park after the 1851 Great Exhibition) until it burned down in 1936; it was actually made of plate-glass and cast-iron but it was widely called the Crystal Palace after the playwright Douglas Jerrold called it “a palace of very crystal”. Arsenal’s new ground, which replaced nearby Highbury in 2006, is named after the club’s sponsors, the UAE airline which also sponsors the cable cars over the Thames. It had been the site of a rubbish processing plant prior to the building of the new stadium and was called Ashburton Grove prior to the sponsorship deal (for sponsorship reasons, UEFA officially refers to it as the Arsenal Stadium, which was Highbury’s official name). Ashburton means ‘farm by the ash trees’, and the only place in England with that name is a small town in Devon. Brentford FC’s home since 1904 is renowned for being the only English league ground to have a pub on each corner, and the ground is named after one of these. When Brentford started playing there, they had no changing facilities and so the players had to get changed in one of the pubs — the Griffin, named for the Griffin Brewery in nearby Chiswick which was and still is run by Fuller’s. The stadium’s address is actually South Africa Road, although the street after which it is named is nearby (it also gives its name to the Loftus Road End). The ground opened in 1904; QPR moved there in 1917. Loftus means ‘house with a loft’; it is not known if there is any connection between the naming of the road and the town of that name in Yorkshire. For more on QPR's grounds see our article on roving footy teams (which this team easily wins). In case you were wondering, the use of the apostrophe is correct as the Home of Cricket is named after the professional cricketer Thomas Lord (1755-1832), who founded his own cricket ground, which he named after himself, in 1787. This was part of a deal with a private members’ club called the White Conduit Club which renamed itself the Marylebone Cricket Club (MCC) at the same time. The lease on that ground (now the site of Dorset Square) expired in 1810, after which Lord and the MCC moved to a new venue, only for this to be requisitioned for the building of the Regent’s Canal. Lord literally took the turf with him to a third site in St John’s Wood, which opened in 1814 and is the site of the present ground. It is still owned by the MCC; Middlesex CCC are its tenants. Lord's. Photo by Hammer Head from the Londonist Flickr pool. The home of Surrey CCC since 1845, the Oval hosted the first Test match in England as well as the first FA Cup final. In recent years it has been officially referred to in conjunction with a sponsor (Foster’s Oval, Kia Oval, etc). The name, which has been exported to cricket grounds around the world (Kensington Oval in Barbados, Adelaide Oval in Australia) actually pre-dates the cricket ground. Kennington Oval had been a market garden so named for its shape. The land was, and still is, owned by the Duchy of Cornwall (here's more on who owns what in London) — which, presumably, is why Surrey CCC’s badge is the Prince of Wales’s feathers rather than the county coat of arms. We probably don’t need to explain how the park got its name, although it might be worth looking at some of its constituent parts — although not the London Aquatics Centre which is fairly self-explanatory. The Olympic Stadium, set to host some of this year’s Rugby World Cup matches prior to re-opening as West Ham’s new ground in 2016, is London’s third Olympic stadium although it’s the first to have the word ‘Olympic’ in its title (the others were White City and the Empire Stadium, aka Old Wembley). The Lee Valley Velopark is named after the nearby river, using one of two possible variants on the spelling — as is the Lee Valley Hockey & Tennis Centre. The Copper Box, now the home of the London Lions basketball team, was named for its colour and appearance. The home of Crystal Palace FC since 1924, Selhurst Park had previously been the site of a brickyard. The ground has also been used for boxing and cricket, and both Charlton Athletic and Wimbledon have at times ground-shared with Palace. Selhurst means ‘willow wood’ and the name dates back to at least the thirteenth century. Chelsea’s ground is actually located in Fulham, and opened as an athletics venue in 1877 (football did not come to it until 1904; Fulham turned the place down, so the owners set up their own club to play there). The name derives from the Old English ‘Samfordesbrigge’, meaning ‘the bridge at the sandy ford’, the place where the Fulham Road crossed Counter’s Creek, a tributary of the Thames. The home of Harlequins RFC is located across the road from Twickenham Stadium. It had been an athletics ground before Harlequins acquired it in 1963, and they named it after Adrian Stoop (1883-1957), who played for the club between 1901 and 1939, was capped 15 times by England and later became the club’s president. 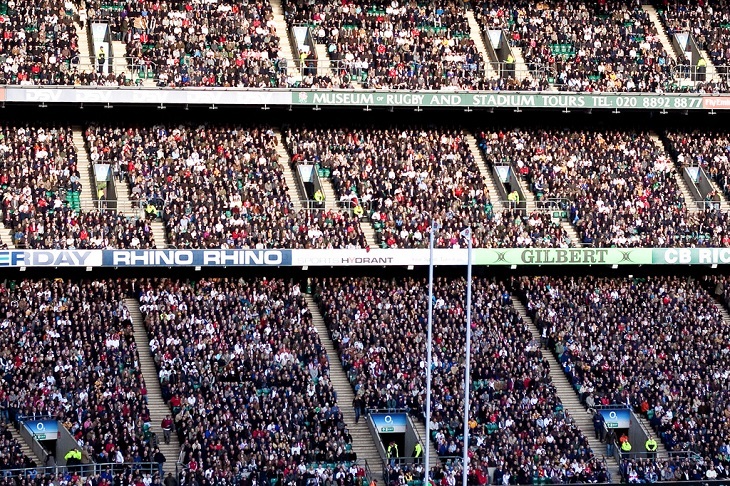 The home of the England rugby union team is (in terms of capacity) Britain’s second-largest stadium after Wembley. Built in 1907, ‘Twickers’ hosted the Rugby World Cup final in 1991 and will do so again on 31 October. The name dates back to the Dark Ages; two variants, ‘Tuican hom’ and ‘Tuiccanham’, appeared on a charter written in 704AD. The word ‘ham’ is Saxon and means a settlement, possibly near a marsh or a river; historians have suggested that ‘Tuica’ was the name of a person who lived there. Twickenham. Photo by Anthony White from the Londonist Flickr pool. West Ham United’s soon-to-be-former home, which opened in 1904, is officially called the Boleyn Ground, due to the area’s presumed associations with Anne Boleyn, Henry VIII’s second wife, whose family is said to have once owned the land on which the stadium is built (a building that had previously stood on the site was called Boleyn Hall). Upton is a fairly common English place-name; the one in West Ham was called ‘Hupinton’ in the 13th century and is reckoned to mean the upper part of the village. The home of Charlton Athletic dates from 1919, at a time when the club was looking for a new ground. They found an abandoned sand and chalk pit in Charlton and could only afford to develop it after large numbers of volunteer fans dug a pit for the pitch. The name is believed to originate from the ground’s original, apparent valley-like appearance. The original, twin-towered Wembley Stadium was actually called the Empire Stadium because it was built for the 1924 British Empire Exhibition, although it had opened (and hosted its first FA Cup final) in the previous year. It was the main venue for the 1948 London Olympics and hosted the 1966 World Cup final, and for many years it had a greyhound track running round the perimeter of the pitch. The ‘Empire’ name appears to have been used until the early 1980s. Old Wembley was closed in 2000 and demolished three years later; the new stadium opened in 2007. The name Wembley dates back to Anglo-Saxon times; Wemba was a person who either lived in or owned the lea (meadow or clearing) hereabouts. Spurs have played at the Lane since 1899, although the stadium is actually located on Tottenham High Road. The eponymous lane is a few hundred yards to the north — White Hart Lane railway station, which pre-dates the football ground, is located there. It — the lane, not the station — is recorded as having existed as far back as the seventeenth century, and is presumably named for a local inn called the White Hart which was used for court sessions in the 1650s. As a pub name, the White Hart is derived from the heraldic badge of King Richard II. As well as the tennis tournament, SW19 is also home to one of London’s last remaining greyhound tracks. The All England Lawn Tennis & Croquet Club was formed in 1868 (although it originally just concentrated on croquet) and hosted the Championships (the oldest tennis tournament in the world) for the first time in 1877. Like the MCC, it is still a private members’ club. The dog track, which hosts the prestigious English Greyhound Derby, has been going since 1928 (it is one of just three tracks left in Greater London, the others being at Crayford and Romford). The name means ‘Wynnman’s Hill’ — ‘dun’ being Old English for hill. Unfortunately, little is known of who Wynnman was, rather like his possible contemporaries Tuicca and Wemba. 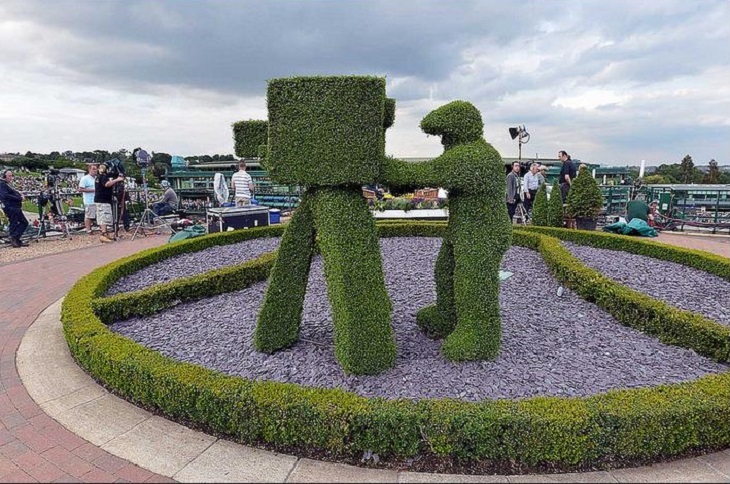 Inside Wimbledon. Photo by Mike King from the Londonist Flickr pool. Built for the 1908 Olympics, the Great Stadium (as it was originally called) would go on to host football (it was the only London venue other than Wembley during the 1966 World Cup), greyhound racing, speedway, boxing and rugby league. It was demolished in 1985. During the period 1908-1914 the area had, in addition to the Olympics, hosted several large-scale exhibitions; due to the white marble cladding used on the pavilions, it was nicknamed the Great White City. Want more like this? Try our article on How London's Football Teams Got Their Names. Please note, we’ve limited the venues here with the only football grounds those of clubs in either the Premier League or the Championship this season, and only rugby grounds that are home to Premiership teams (and located within Greater London — London Irish play in Reading, so their place doesn’t count). Know any other good stories related to the names of other London sports venues? Let us know in the comments below.